Joojeh is literally the Persian term for grilled chicken and joojeh kebabs are one of the most popular and common dishes found in Iranian cuisine. Skinless chicken breast is most often used but you can also cut up an entire chicken and use all the parts. The chicken, cut into chunks, on or off the bone, is marinated in a mixture that can include lemon, oil, onion, yogurt and often saffron. After about a day in the marinade, they're threaded on skewers and grilled. In more formal settings like restaurants or catered events, you're likely to find the grilled kabobs served with their skewers on a bed of basmati rice. But home cooks or street food vendors frequently pull the chicken off the skewers and serve them in lavash which is a thin, soft, unleavened bread common in Turkey and Iran. You can also serve it with pita bread, of course. If you're more familiar with the term shish kebab, the word shish is Turkish for skewer and, in Turkey, you shish kebab will likely be lamb. The term kebab, however, is commonly used in the Middle East to denote any kind of chunked meat. Therefore, saying joojeh kebab means a grilled chicken on a skewer. Grilling things on skewers is now pretty common in the United States and it can be meat, seafood, vegetables or even dessert items like fruit and chunks of cake. And actually serving it with the skewer is a fancier presentation, just as it is in the Middle East. I've been to plenty of summer cook-outs where beef or chicken chunks were threaded on skewers and alternated with chunks of onion and bell pepper. But the key to an authentic joojeh is definitely in the marinade. Enjoy! Rinse the chicken with cold water and pat dry with a paper towel. Cut into 1-inch chunks. Mix together the olive oil, grated onion, saffron, salt, black pepper and crushed red pepper to make the marinade. Soak the chicken breast pieces in the marinade and refrigerate for 24 hours prior to cooking. Preheat a grill to medium-high or the oven to 350 degrees (F). Place the chicken cubes on skewers and cook until the chicken reaches at least 165(F), about 15-20 minutes on the grill or 20-30 minutes in the oven. 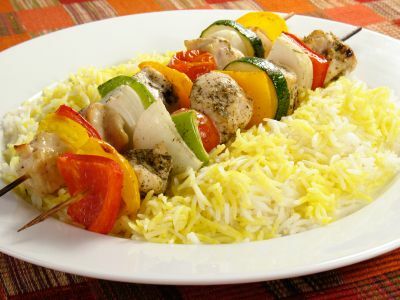 Serve the kebabs over a bed of basmati rice with grilled vegetables.